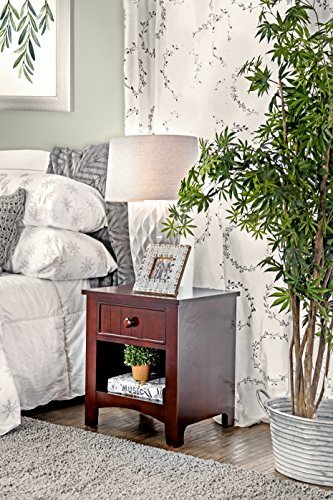 Store much needed bedside necessities in this compact nightstand that matches almost any decor. A single drawer and open compartment provide space for the bare essentials while the expansive top can fit a table lamp, alarm clock and some decor. A round knob allows you to easily open the drawer to access the contents within. This piece is sure to last with its solid wood and wood veneer construction and is available in three beautiful finishes: Dark Walnut, Oak or White. Made in Vietnam, light assembly required. Spot clean, no harsh chemicals should be used. Dimensions: 19"W x 16"D x 21"H. Decor not included.